The market volatility over the last two weeks has been the equivalent of whitewater rapids. 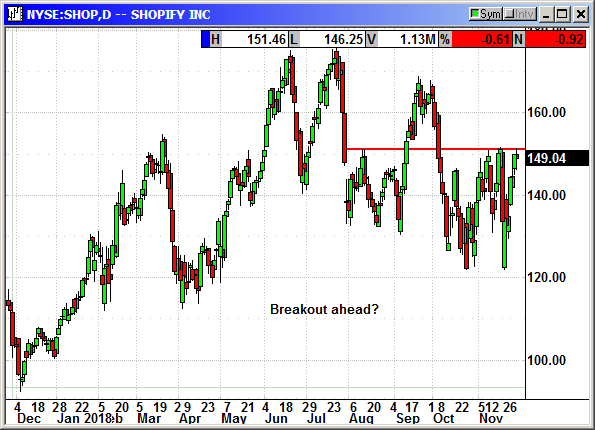 We had periods of calm interspersed with some serious market swings. 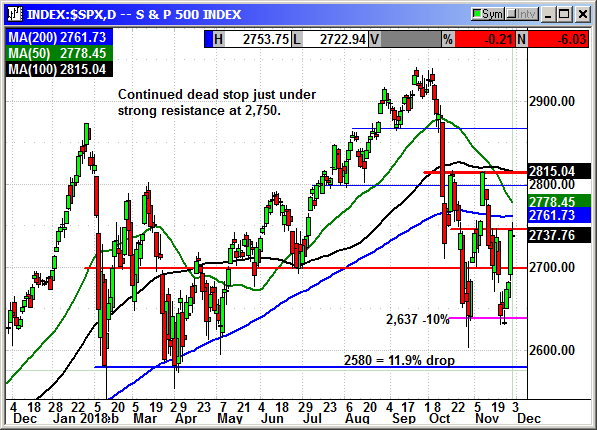 The Dow gapped down over 600 points on the 20th and lost nearly 1,200 points last week. A period of calm appeared for a couple days and then we rocketed into another stage with the 600-point gain on Wednesday. Selling premium in this market is suicide. Not only do we have crazy market swings, the last several days of positive direction has caused put premiums to evaporate. We are rapidly approaching the clash of titans when President Trump and President Xt meet in Buenos Aires on Saturday. There has been no shortage of pre-meeting posturing by Trump and everyone on his team. The threats hiking the existing tariffs from 10% to 25% have been repeated daily along with threats to put tariffs on the remaining $267 billion of Chinese exports. On Thursday, there was talk of raising the tariff on Chinese cars to 40%. China has been relatively quiet and has failed to join in on the pre-meeting bluster. I suspect President Xi understands the threats for what they are, simply a negotiating tactic. The showdown could get messy if Trump does not get his way. Analysts believe there will be a negative outcome OR a negotiated settlement where China agrees to buy billions of dollars in LNG and soybeans in order to pacify Trump and let him claim a win. Regardless of the outcome, the market is likely to swing 1,000 points and the direction will be dictated by the results of the meeting. Currently it is a coin toss. If the result is more tariffs the market will react badly. At the end of the week we have a very strong potential for a partial government shutdown over border security and funding for Homeland Security. That could also roil the market. The weekend event risk is very high for the next two weekends and it will be very dangerous for anyone selling premium and hoping for a peaceful expiration. The major indexes are stalling at resistance while we wait for the meet and greet. I would be very surprised if there was a decent gain on Friday. Most traders are probably going to be moving to the sidelines. The December options have no premium left so we moved to January. 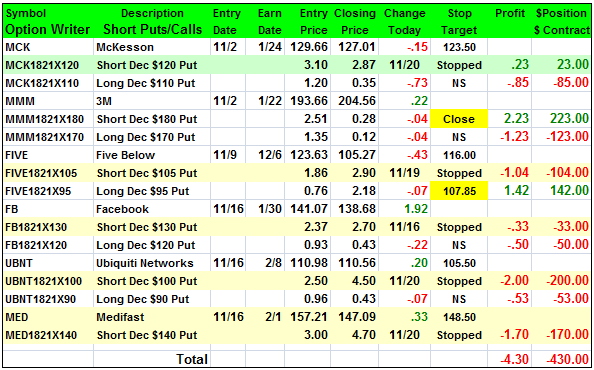 Because of the volatility I only added two positions. There is a chance there will be no letter next Thursday. I am going into the hospital on Monday for a procedure. Depending on the results, I may or may not be back at my desk by Thursday. I appreciate your understanding in this potential scheduling challenge. Getting old is the pits. The Dow gapped down -600 points on November 20th and lost -576 for the week only to follow up that performance with a a -1,127 decline last week. 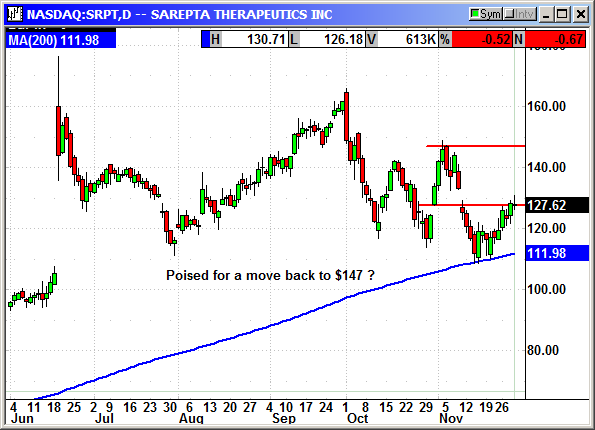 All but one of our positions was stopped in the extreme volatility. We should not be selling premium in a market that is moving 1,000 points per week. I am only recommending two positions ahead of the G20 trade summit with Trump and Xi. 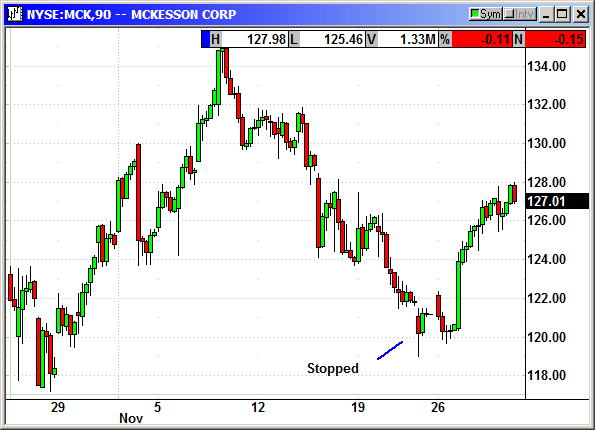 We were stopped on the short put in the 600 point gap lower on the 20th. 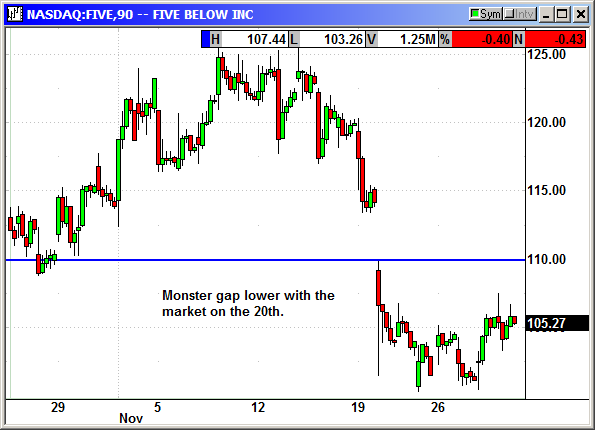 FIVE gapped down -13 with the market on the 20th to stop us out. 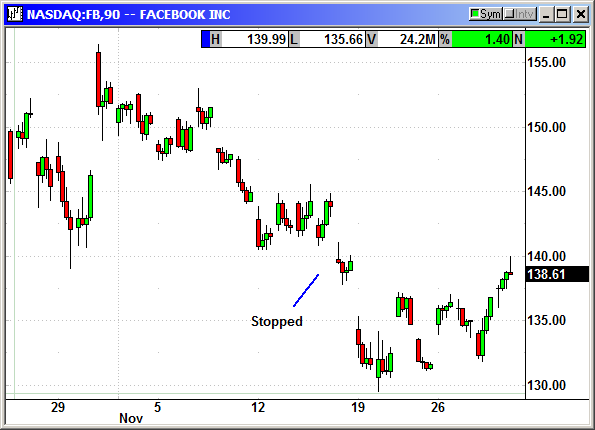 Facebook did not wait for the market crash on the 20th. Shares continued to implode almost immediately upon entry into this position. FB appears to be gravely injured and while still a great business model, there are warts popping up everywhere. 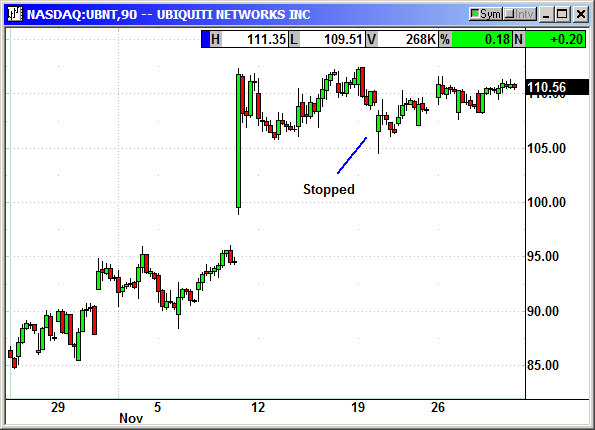 UBNT gapped down -$5 with the market on the 20th to stop us out. No specific news. Just a weak market. 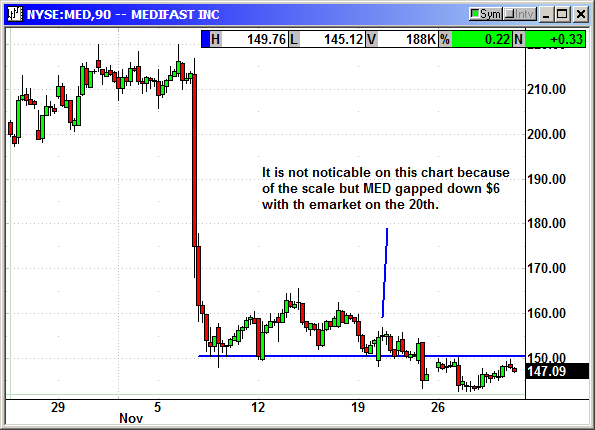 MNedifast gapped down $6 with the market on the 20th to stop us out. No specific news. Just a weak market. 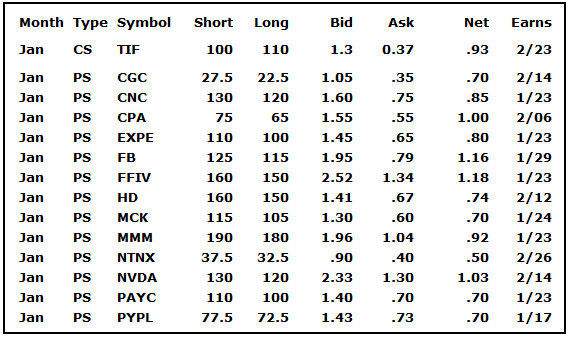 These are not official plays but a good place to start if you are looking for something else to trade. December expiration is on the 21st and January is on the 18th. 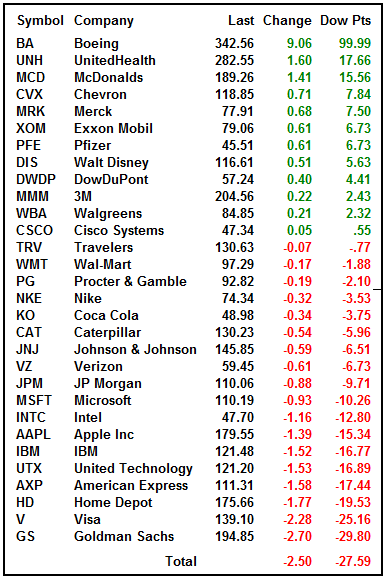 Earnings dates are never guaranteed. Sometimes the dates change 2-3 times depending on various factors. In most cases the dates are provided by a third party like Zacks and they are using predictions based on the prior earnings. If a company reports on Wednesday Jan 24th then they expect them to report on a Wednesday around the 24th in April. The majority of the time they are close and once we move nearer to April, the company will announce when they are going to report and the calendar is updated. If you are in a position, you should always check at least weekly to see if an earnings date has been posted. 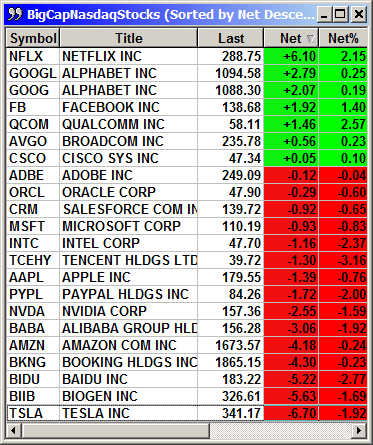 You should always exit a short position the day before earnings.